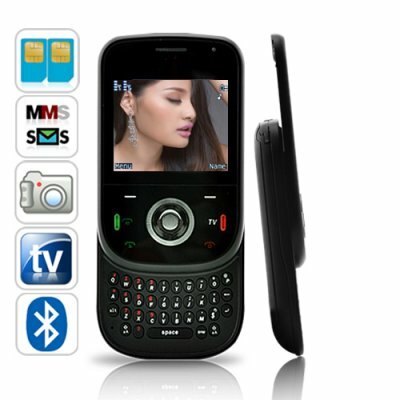 Successfully Added Carbon Slider Dual SIM China Cell Phone w/ Keyboard to your Shopping Cart. Attractive China slider cellphone with QWERTY keyboard. The Carbon China Cell Phone has GSM quadband and dual SIM, dual standby functionality, tons of multimedia and productivity features. It even comes with a free 2GB TF / microSD card! Feast your eyes on The Carbon China Cellphone! For a sub-80 dollar cellphone, you can't beat The Carbon China Cellphone for quality and innovation. It's got a slider QWERTY keyboard which makes it perfect for 24 hour on the go business people and text crazy teens! Take photos, create videos, listen to MP3s, watch videos, read eBooks - The Carbon China Cell Phone is a multimedia maven. This attractive beauty performs like a pro and is priced oh so right - Get yours today. Brought to you by Chinavasion - The Leader in online China wholesale and dropshipping. Able to assign a separate photo, ringtone, and video for each caller on your contact list!